Know when to stop. I always tell myself that when I’m drawing. But sometimes it’s hard to step away from a subject. 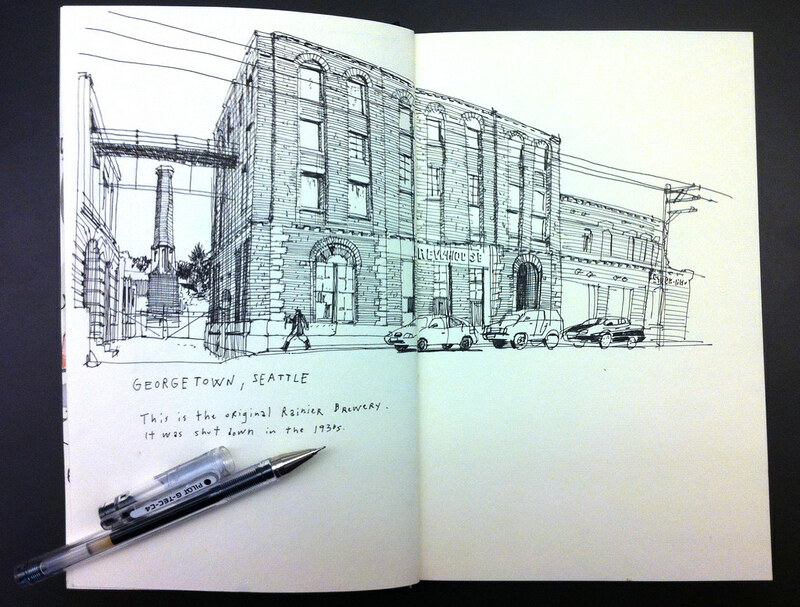 In my defense, the original Rainier Brewery complex along Airport Way South is just too captivating! My plan with this sketch was to focus on the view of the chimney through the centenarian brick buildings and use the rest of the sketchbook spread to draw other things. But then I thought, why not keep going and draw the whole thing? Unfortunately, I wasn’t totally convinced it would work and my hesitation translated into sloppy measuring as I approached the fold of the sketchbook. Pretty soon I was looking at a larger sketch than I had anticipated, with the right half of it suffering from poor perspective and more distortion than I like to tolerate. You can scroll through the sketch below and see what I mean. The sketch was fun to make nonetheless, and it received a really positive response from a group of Spokane tourists who were visiting the neighborhood. 0.4 Pilot G-Tech-C4 pen on 5.5″ by 8.5″ Stillman & Birn Gamma Series hardbound sketchbook.